For advanced office and hospital based surgical procedures, our patented Surgitron® Dual RF™ unit provides the unparalleled surgical control, precision, and safety you need. Expand your practice and capabilities with our cutting edge Surgitron Dual RF 120 generator. Our patented technology uses a high frequency of 4.0 MHz that minimizes heat dissipation and enables you to perform more advanced surgical procedures whether in office or hospital based. 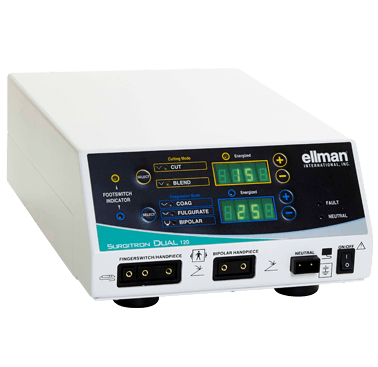 Discover how to set up the Ellman Surgitron Dual RF High Frequency RF Generator and prepare it for use.